Welcome back to Robot Wars after a two week absence due to tennis and to be honest most of this heat wasn’t worth the wait. This heat wasn’t marred thankfully by robot breakdowns like others were but it was still a rather boring affair due largely to bad driving on the part of multiple teams that saw uneventful and anti-climactic battles which in one case saw a team accidentally flip themselves and leave both teams just spinning in the breeze. Out of the 6 teams in this episode only veterans Thor and Pulsar’s upgrade Magnetar really stood out with an ability to do damage and my word did the latter of the two do damage. While Pulsar was plagued by mechanical problems to the point of annoyance Magnetar was incredibly reliable, tearing apart opponent after opponent including Thor in the heat final. Thor as usual did some damage elsewhere but a couple of lucky hits in a pair of matches saw its Co2 supply damaged and reduced to a shunting machine. While those two had some entertainment factor the others were seriously lacking. In particular the fight between Push To Exit (still led by a longtime dickhead) and school team Expulsion was a laughing stock as PTE just failed to function at all as a flipper before just dying while Expulsion strayed on the floor flipper and immobilised itself. One of the final two robots Coyote tried to do some damage but really wasn’t able to, with its grabbing jaws unable to get a hold on anything, but managed to last until reaching fourth place (Expulsion managed a lucky win to get to the free for all). Finally though we had Hobgoblin who just fell apart in each battle, ending up upside down within the first few second of its first battle. If anything really the real show stealers ended up being the House Robots who actually did a lot of damage this time round, with Matilda’s crippling of Thor providing a rather nerve-biting semi-final between it and Coyote. Overall however the show’s latter heats have had the same problems as the previous series’ in that the placing of the heavyweights in the first two shows have left the latter episodes lacking when it comes to the big names. 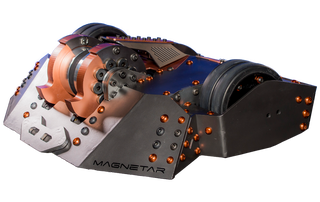 Next week however is the final and maybe, if it goes Magnetar’s way, we’ll get an interesting showdown between it and Carbide.